More info:Plus local payment from USD 1110 to USD 1120. 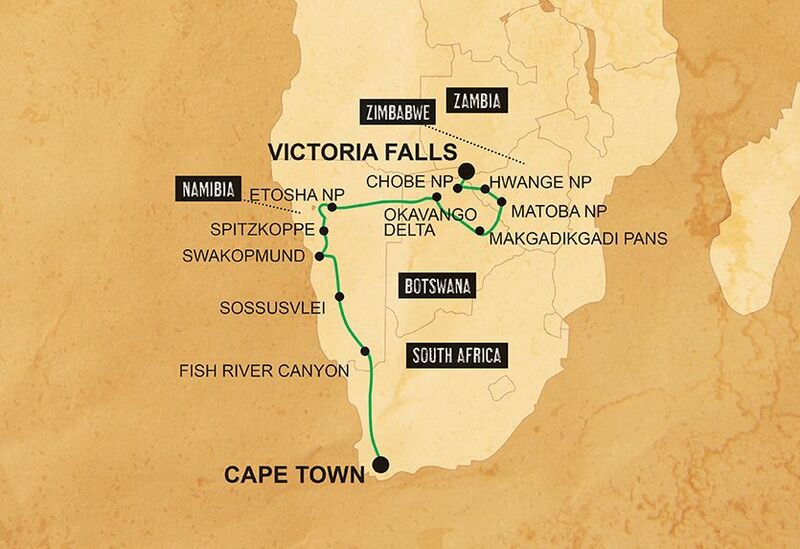 On this epic trip through Zimbabwe, Botswana, Namibia, and South Africa, we will be traveling overland using a combination of overland vehicles, boats, and 4x4s, thus cutting out the need for air travel and reducing carbon-emissions. Going overland (by car and on foot for excursions) means you get to experience physically crossing the borders between countries as well as explore places which are off the beaten track. We have a strict set of rules regarding wildlife-spotting, for example when in Hwange, Matobo, and Etosha National Parks, and while in the Okavango Delta. In order to minimise the impact of our presence on the wildlife and ecosystem of the areas where we travel, we explicitly forbid any involvement in activities that harm or exploit animals, and advise our crew in specific activities to avoid in this regard. In Hwange National Park we visit and support the Painted Dog Conservation Project, an organisation dedicated to the conservation of these very rare animals, raising awareness of their plight and educating the local people about them. In Bulawayo we will take a guided walking safari with one of Zimbabwe’s most dedicated rhino conservationists, our funds going towards is conservation projects in Matobo National Park. We will also have the opportunity to visit and support the Chipangali Animal Rescue Sanctuary, which work to rehabilitate rescued animals into the wild. Wherever we are in the world, we prefer to use smaller locally-owned businesses, ensuring that local communities gain a direct economic benefit from our business, for example, we use small locally owned hotels, campsites and activity providers wherever possible. We use local guides and operators throughout the trip; for example, in the National Parks we use responsible local operators that provide training and employment to many local people as guides, providing them with stable employment in the tourism industry. We also feel it is important that our guests immerse themselves in the culture of their host country and we ensure that we weave experiences that will facilitate this into our itineraries. We are also involved with a variety of community projects in key destinations as we visit. Our involvement with these projects is a long-term commitment, allowing us and our passengers to participate directly in delivering real practical benefits to the communities we travel through on the ground. The projects are not tourist initiatives, but a way of employing tourism to generate funding and support and facilitate community interaction. For instance, in D’Kar we stay at a community-based tourism project dedicated to preserving the livelihoods and culture of the San people.